I love stories about old baseball. They all involve games with dozens of runs scored, someone getting punched, and an immigrant with a farm animal cursing a team. One such source of great stories is Jimmy "Pony" Ryan of the variously named Chicago White Sox (my favorite being the Orphans). A bit of a hot-head, he was famous for punching multiple reporters, players, and a clumsy train conductor. 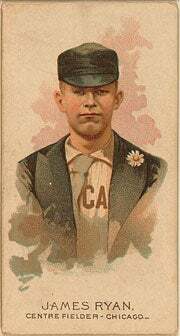 He's also the only player ever to hit for the cycle in a game — a 21-17 game against the Detroit Wolverines in 1888. It's possible, if Pony were alive today, he'd punch the 2011 Dodge Durango, which TroyQueef thinks is in the midst of another kind of cycle. Can we somehow break or accelerate this life cycle / vicious circle? 4. Moms needs big cars. 6. Wagons get image of "grocery getters", hence wagons become uncool in the general awareness (except in Jalopnik Commentariat´s awareness of course, because they don´t care about image). 8. New moms don´t drive wagons, because they think they are uncool, get Minivans. 9. Step 6 is repeated for minivans. 10. A new generation of mums grow up (step 1-4). 11. Wagons and Minivans are already uncool, so they switch to SUVs. a) You can´t drive an SUV because you will look like a soccer mum. b) SUVs have a new target buyers, OEMs take all offroad-ability away. I) What market segment will mums and marketing ruin next? II) How long will it take before you can be seen in a real SUV again? III) Why does family use render cars uncool? IV) What can you drive and still not be bored to death if you have a family? I know what you all are thinking now. But except BMW M5 wagon and Merc E63 estate?